Reliable range ammunition doesn't have to cost a fortune. 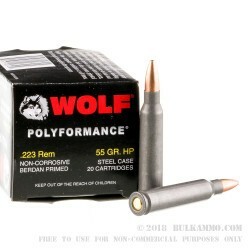 Many high-volume shooters embrace the affordability and performance of non-reloadable steel cased ammo, like this .223 Rem by Wolf Polyperformance. 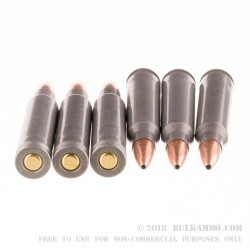 These Russian-made .223 cartridges feature 55gr bimetal hollow point (HP) projectiles. The lightweight HP bullet generates an impressively high muzzle velocity of 3241 fps and a moderate energy transfer. The HP expands nicely, which makes this an acceptable ammo option for varmint hunting as well. 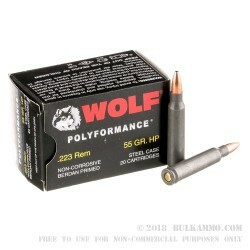 These Wolf Polyperformance .223 Rem cartridges are encased in Berdan-primed steel casings that are coated with a polymer substance to prevent corrosion. These cartridges feed and ejected just like brass casings, and they won't damage your firearm. Wolf believes you don't have to sacrifice performance for price. Order a few 20-round boxes of this 223 Rem ammo today and try Wolf steel-cased ammo for yourself.